What do the Pantheon, Michelangelo’s David, the Peace Monument of Washington, DC and The RE Store all have in common? Italian Carrara marble. 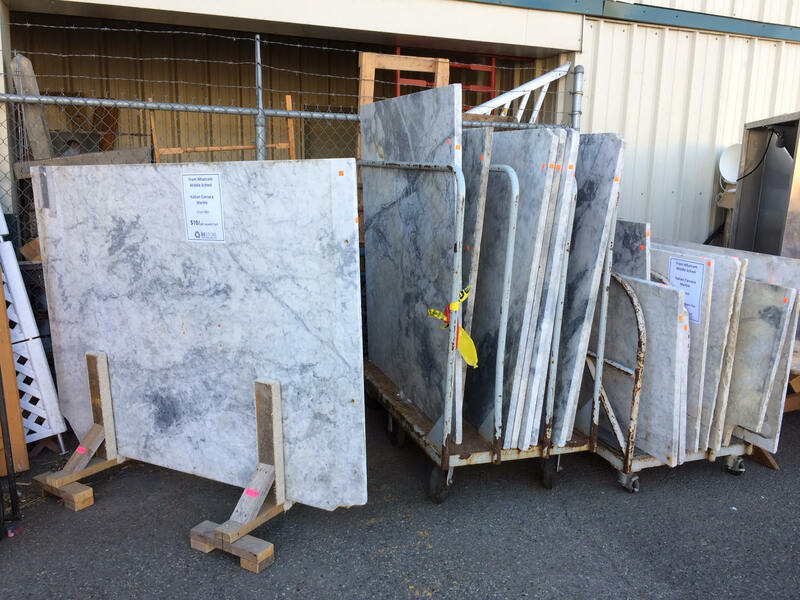 If you follow us on Facebook, you’ve seen that we recently received a load of Italian Carrara marble slabs from Whatcom Middle School. Built in 1903, Whatcom Middle School is the oldest existing school building in the Bellingham School District. Like many of the institutions of it’s time, the bathrooms of Whatcom Middle School were constructed of marble. In 1916, the school received a large addition and tripled in size. It changed names a few times and in 2009 it was devastated by a fire. After the fire, much of the interior was salvaged for later use. The Italian Carrara Marble that we currently have for sale was salvaged from the original bathrooms. The marble itself is gorgeous, but it’s more of the story of this amazing material that dazzles. Carrara marble has been harvested since the time of Ancient Rome and has been used in some of the most remarkable buildings and sculptures known. Part of that list includes the Pantheon, Michelangelo’s David, the Peace Monument of Washington, DC. Marble from the Carrara mine varies in color, but the most famous is Statuario, a pure white marble. By the end of the 20th century, all known deposits of Statuario near Carrara were considered played out. A great example of Statuario marble in use can be see in the Pieta, a masterpiece of Renaissance sculpted by Michelango and housed in St. Peter’s Basilica in Vatican City. One of the wonders, joys, and primary objectives of architectural salvage is to save rare materials for re-use. The salvage of the Italian Carrara marble from Whatcom Middle School is a prime example of how the practice of salvage and deconstruction can benefit generations to come. Can you imagine what a disappointment it would have been for this stunning material to end up in the landfill? If you’d like a piece of this marble for your own, be sure to stop by our store at 2309 Meridian St. or call (360) 647-5921 for more information.